Children's Krav Maga mostly referred to as 'Kid Krav' it is developed by IKMF as part of Krav Maga self-defense solutions created for the various civilian sectors. Kid self defense enables children, in a relative short period, to learn self-defense techniques carefully adapted to match their respective age, physical and mental abilities. Through Krav Maga training, the children are taught how to recognize common threats like bullies and kidnappers. The training also aims to improve their self-esteem, build confidence respect and discipline. IKMF Kid Krav Maga methods, especially in the younger age group are mostly taught through Kravmaga games. Games help the children develop coordination; learn how to follow directions and foster assertiveness. Through these games kids are taught how to avoid confrontation, and how to defend themselves when necessary in order to escape. Kid Krav Maga openly and cautiously explains attack scenarios kids may encounter the difference between being bullied by a classmate or by an unknown adult, their options in each situation, what is the proportional response and so on. The IKMF system divides Kids' Krav to five main age categories. As the children get older training includes fewer games and resembles the adult curriculum more. Children who train Kravmaga learn a lot about commitment and endurance. Krav Maga teaches them to appreciate and be proud of their achievements when learning a new technique or passing their grade test. They get a true sense of the path they are on and their progress and they realize that no goal is impossible. In the process they also get a great work out!Kids who need to let out steam can also get a break in Krav maga training. 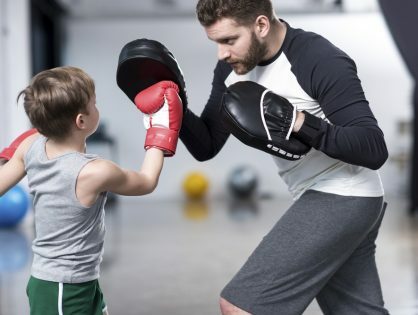 They're permitted to hit the punching bag, fight with another student under the instructor's supervision and in the process learn that without these pre-conditions it is not ok to hit or fight. The Mayor of Tel-Aviv then decided to start a project for teaching children, which has now become a very profound way of reducing violence and educating children to become better people.